Can you imagine driving your brand new electric car around the city and suddenly the doors pop open? That is what hackers proved they could do in a test or challenge at the University of Zhejiang in China. The Tesla Electric Model S hacked and had its doors popped while moving at speed. This would be a scary even if it was not a test run by Tesla. It was a challenge to improve the security of their car. The Tesla Electric Model S test was run at the University of Zhejiang with a top prize of $10,000 designed to use hackers help the Tesla team find out what they needed to do to improve the security of their car. If the doors can be popped, it can also be stolen using the same techniques and this is something that Tesla does not want to be known for. Tesla supported the idea of testing and developing better security. As our cars become more and more electric and run by computers with communications tethers to various devices needed to support the car and report operating status it will become increasingly important these cars cannot be hacked. Take Googles driver less car as an example. Using a combination of sensors, GPS and communications abilities it is fully electronic and prone to hacking. All of these vehicles are at risk unless more tests are run like the one on the Tesla Electric model S electric car. There is a strong need to get this resolved prior to the market being inundated with electric vehicles. We are only at the beginning of a new era where electric vehicles replace the combustion drive cars. We need to get this right. Why is this only limited to electric vehicles? This is another question that we wonder about. Many old technology cars burning gasoline are also linked to satellites and are now offering WiFi connections. Is it possible for these cars to also be taken over and controlled. We do not know the answer, and would be happy for someone to let us know if traditional powered cars can also be hacked? This post is about a Tesla model S software update, however first we want to talk about the fires. There have been several fires associated with the Tesla model S all electric car in 2013. Two of the fires were caused by metal debris laying on the road. This debris hit the battery pack when it was driven over. The metal debris punctured the battery pack. This caused the battery pack to short out and start a fire. In both cases the passenger and driver were fine. They were able to pull the car over to stop. They got out of the car before there was any problem. On a traditional car any number of problems could have occurred. For example a punctured gas tank, brake lines and fuel lines could have been punctured. Any of these could have caused a fire or an accident. The motto regardless of what car you drive is pay attention to what is on the road. Avoid it if you can without swerving or losing control of your car. The other fire was caused by an over heating a wall charger. This happened in California in a garage while the car was being charged. The wall charger became too hot and caused the fire. Tesla has updated the software associated with charging the batteries to recognize this problem and control the charging of the batteries to reduce any possibility of fire. The new software will reduce the current by 25% if needed so it can automatically regulate the power input to the battery. Tesla is constantly upgrading their car and making improvements as more and more drivers purchased this Tesla model S all electric car. There are currently 19,000 vehicles on the roads in North America and Europe. According to government testing this is the safest car they’ve ever tested which is a testament to the design team at Tesla. It can only get better as Tesla fine tunes this car and continues to improve it. Their biggest roadblock is the distance you can go on a full battery and also the number of recharging stations around the country. They are building more and more all of the time. Recently Tesla has announced that they are going to install a protective plate under the car to protect the batteries from further incidents that could cause them to short out and start a fire. Time will tell if the combination of the software update and the metal plate will eliminate any further battery fire possibilities. All electric cars provide different accident results than the standard gasoline powered engine car. For example the Tesla model S, which is one of the best electric cars available on the market and also the most expensive has had three fires in the last several months. As with all statistics you really need to delve into the details to find out more about the problem. In this case it is not a chronic problem, rather it is a design issue that has already been updated to make the car even more safe than it already is. All the fires involve the battery pack. Which is slung low on the body of the car to provide increased stability in rollover situations. In fact it is extremely difficult for the Tesla model S to rollover. Even at extreme speeds due to the position of the battery pack. It also makes the battery pack more exposed to damage from road debris. All of the fires involving the battery pack have been caused by the battery pack housing being punctured. Usually by road debris that could not be avoided by the driver and a fire starting as a result. In all accidents the occupants have been able to walk away from the accident or fire in this case since it really was not an accident. In this last accident, the car drove over a metal object. A tow hitch which was on the road and could not be avoided. The tow hitch punctured the undercarriage and specifically the battery pack which caused it to short out and start a fire. Based on testing the Tesla model S is the safest car on the road for drivers. There are over 19,000 T model S cars on the road worldwide at the time of writing this post. The Tesla model S has earned the highest score possible in crash tests ever recorded by any vehicle. That is a pretty big endorsement for a relatively new car on the market. Improvements to protection of the battery pack will improve the safety of this car even more than what it already is. Tesla motors is continuing with its planned cross-country network of friendly electric charging stations to enable their all electric Model S roadster sales and customer experience . They have just announced in the fall of 2013 that Tesla model S owners can Drive Your Tesla from Tijuana to Vancouver. This is along the entire West Coast of the United States. They can take advantage of their free supercharger network which is now energized. As a result Tesla drivers can now drive from Vancouver all the way to Tijuana. 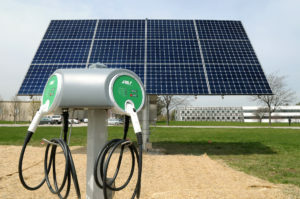 They can count on being able to recharge their cars quickly at a number of charging stations. Charging stations have been installed along Highway 101 and also on Interstate 5. A full charge takes about one hour while half the charge in 20 minutes. The stations are free for Tesla drivers and covers major highways on the East Coast of the United States. As a result you can stop to charge your car and grab a quick bite. Also visit the washroom and your car is just about fully charged. Over the next two years every superhighway and every state will have charging stations. They will support Tesla Model S drivers on cross continent trips. An Amazing Objective! Hence as volume picks up more and more stations will be installed. They will support the increasing number of electric cars on the road. The plan is to have a super charger station every 80 miles along major highways. With more and more companies getting into the act, there will be added stations in small towns. Also along less traveled roads over the next 5 years. The construction of this charging network will be the catalyst that enables electric vehicles. It could make it possible for them to really gain a foothold in American car culture. A Tesla battery can be swapped out in as little as 90 seconds and replaced with a fully charged battery. The cost is planned to be about the same as a full tank of gas. The driver can be on his way quite quickly. It is not clear how many stations will have this capability at the present time. Or how many drivers would be willing to pay this extra amount vs. taking a break while their car recharges. Drivers will need to decide on whether they want convenience. Or are willing to wait for more economic recharging of their batteries. The Tesla Model S earned the highest crash test scores of any car ever tested! In case you are wondering, this is a brand new all-electric sport car that can put many gasoline driven cars to shame. Its only drawback is that it needs to be recharged often which makes it an issue for long trips. But it is apparently the safest car on the road, bar none. This one caught fire when a piece of metal lying on the road flipped up and damaged the battery case on the underside of the car. More protection was added since this particular fire took place. Tesla is saying, that it got an A plus in NHTSA’s crash tests. And it got the best A plus ever when compared to any other car that has been tested by the NHTSA. The reason is no engine and lots of cushioning at the front of the car to absorb head on energy from a crash. This energy absorption protects the occupants of the car. When combined with air bags it means you have a far greater chance of surviving a head on collision in one of these all-electric cars. The Model S also outperformed other models in the government’s side pole impact test. This mimics a vehicle sliding sideways into a post or tree. This is one of the most dangerous types of impacts. The Model S did exceptionally well in this test because of aluminum rods placed in the side of the vehicle, Tesla said. The Model S also outdid every other model in rollover resistance. During separate independent testing, the Model S simply refused to turn over during even the hardest turns. Special means were needed to get the car to flip. The reason the car is so stable, Tesla said, is that its large, flat battery is mounted in the floor of the car. This creates a very low center of gravity. Any time you have a low center of gravity, it is almost impossible to flip a car. That is why sail boats have ballast at the bottom of the boat to keep them upright. Have you even been on a double-decker bus going around a curve? If you have you will understand how important it is to have a low center of gravity to keep from tipping over. As you might expect by now, the Model S also topped other cars in the roof crush test. In an independent validation of the Model S’s roof crush strength, the car’s roof was so strong that it broke the testing machine. 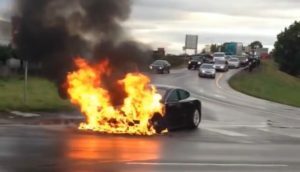 No Tesla batteries have ever caught fire even after high-speed impacts. This car is truly something that other manufacturers of all kinds of cars will aim for or try to emulate. Whether they are traditional gas driven cars, hybrid electric cars or all-electric cars. Tesla is setting the bar pretty high for everyone and the industry can only work harder to catch up. Tesla Robotic Factory has a lot of red robots and a giant roll of shiny metal that looks awfully similar to the paper spools found in many (ancient) newspaper presses. The factory is one of the most modern factories on the planet. Hence it is producing one of the most modern cars every to come off an assembly line. If you are not familiar with this all electric car, take a few minutes to read this post. Also several others we have written on this blog. They are clearly leading the automotive industry at the moment in terms of all electric vehicles. They are currently the leader in Norway and selling well in many other countries. 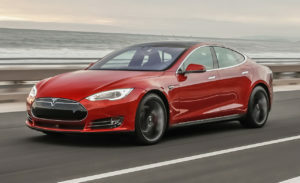 The Tesla model S has also won many awards. One of which is for being the safest car on the road. This is after crash tests have been conducted on the car with both front end and side wall tests. The Tesla Model S protects its occupants better than any other car. Partly to its design and partly due to the unique characteristics of the car. Without an engine to come crashing into the passenger area, the front of the car has much more cushioning power. The panels in the doors are designed to be much stronger. They are energy absorbent than many other cars, which also protects the occupants. The Testla Model S is very difficult to rollover. The heavy battery is mounted so low in the car, that it’s center of mass prevents the car from being tipped over in a situation where the car is in a tight curve or goes down an embankment. This car will not roll over the same way that most other cars will. With such a low center of mass you can drive this car with a high degree of confidence that you will be safe in an accident. The only problem they have now is to find a way to make it go longer on a charge and find a way to charge it more quickly to make it practical for more drivers. Tesla has been rumored to be developing an electric car that will be priced at levels the average consumer can afford. They are also investing in a new battery manufacturing center that will support both the Model S and the new cheaper electric cars. More to come we hope with all of the high safety ideas built in. We recently wrote about seeing the Tesla Roadster in Palm Springs. Just now we saw an announcement about the same car being recalled for a non safety issue. This recall was associated with the rear seats. We have included a picture from the original post. The manufacturer discovered that a weld could come loose in the case of an accident. It was not considered a safety issue. The company is voluntarily recalling the car to have the weld holding the rear seat in place repaired. This is really a minor issue however at the same time no one wants to have a seat come flying at them during an accident. There are enough things that can endanger your life during an accident without a rear seat coming your way. Owners would only lose access to their cars for a couple of hours while the repair is made. The dealers were making arrangements with owners for the cars to be picked up. They will also provide a loaner car if desired while the company fixed the weld. The dealers were doing everything they can to make sure that the owners were inconvenienced as little as possible. After all they paid a lot for this car. They should not have to deal with too much in the way of poor service or lack of service from their dealer or from the manufacturer. This is a luxury car and customers have come to expect a great deal from companies that provide luxury products. This is a new car and a high priced car. The dealer and the manufacturer are going out of their way to make sure that the owners are looked after. They are making sure that the car is properly fixed so that there are no concerns. There have been no customer complaints to date either about the seat repair that is needed. The service that the customer is receiving during this recall has been exemplary. Although at the time of writing this post the recall had just begun. We are confident that the customers will be satisfied with how this issue is being handled. However we would appreciate any comments you have about the car and how the recall is being handled. This repair applies to 1,300 cars that were manufactured in May and early June of 2013. Since the manufacture date is so recent many of these cars may still be in dealer show rooms. In fact speculation had it that only 10% of the Model S cars that have been made during that time frame were actually on the road in customers hands. So the conclusion is that most customers will have their new cars already repaired prior to picking them up before driving them off the dealers lot. This is the second recall for Tesla, which had to recall 429 cars in 2010 to replace a power cable. This is a brand new model and Tesla is an industry leader. Tesla is going out of it’s way to make sure that their customers are looked after and that any negative press is kept to a minimum. A new model car, especially one so expensive and an industry leader in the all electric field cannot not afford to have nay negative publicity. If you happened to be an owner of the Tesla all electric car, we would really appreciate first hand comments about your car. How does it handle? What is the acceleration like? How long do the batteries last and have you ever had to have an emergency charge when your batteries ran out of a charge. Finding a place to recharge the batteries is probably the single largest issue for most owners. We are wondering how they are handling this particular issue. These are all questions that potential purchasers are interested in. Of course those of us who wish we could afford to purchase one of these beauties want to know about these issues. We would also appreciate a guest post about your experience with your Tesla Model S. We would give full attribution rights and a link back to your own web site if you are interested in making a guest post. Just include at least a 400 word comment with your link. We will be glad to post it on our site. We only will take legitimate comments and posts about the Tesla Model S sport car. The Tesla roadster is a sleek electric vehicle running 245 miles on a single charge. It runs 0 to 60 in 2.7 seconds. This particular car is a 2013 model and was seen in Palm Springs. It takes 45 minutes to charge on a 240 volt connection. The trunk is small and this is a really sleek car! This is a superb looking car and it is a very modern vehicle that heralds the future of electric cars. Although it is very expensive at this stage, it is really a test case for the manufacturers to see what works and what does not from everything to how the car performs to the power distribution stations where you can recharge the batteries. At the time of writing this post and information I learned from the owner, the biggest issue is planning your trip to make sure there was a location where he could recharge the batteries. He had to plan his trip around this in much the same way it was 100 years ago when cars were first beginning to appear on the roads. They needed to make sure they knew were the next gas station was going to be or where they could purchase a couple of gallons of gasoline to keep them going. These electric vehicles are much the same regardless of how much you pay for them. You have to plan were you can recharge the batteries and who you can pay to plug your car into recharge. It will be another decade before we see distribution systems offering power to recharge batteries. This is why in the writer’s opinion, the hybrid is the way to go to make sure you can always take advantage of the gasoline engine to power your car when batteries are running low. I cannot imagine driving a car that I paid so much money for and just driving it around the city. I would want to take it out onto the main highways. Really test it out in terms of performance. I would want to take it on longer trips and maybe even on a long vacation. Unfortunately at this stage in the evolution of 100% electric vehicles, recharging those batteries is a big issue. Most if not all of them including the Tesla roadster can be plugged into a regular 100 volt socket that delivers a maximum of 15 amps. The problem with this is that it will take many hours to recharge the batteries. Who wants to wait around for even half an hour for the batteries to recharge let alone for many hours. If you are visiting someone and you recharge the car overnight, this would be no problem. You might even pay your host for the electricity that you are using in much the same way you would pay the local gas station for gas. In the morning your batteries are recharged and you are ready to go. But what if you are on a long trip and cannot stop at a friend’s place. Where do you recharge your cars batteries? California is one of the few states that is setting up recharging stations along the interstate which will charge an electric cars batteries in less than an hour. Again you must know where they are and plan your trip around them. The gentleman in Palm Springs that I met who owns the Tesla roadster was taking his car from Palm Springs to Vancouver where he lives. He was in the process of planning his trip. He had a couple of friends that he was going to visit along the way to recharge his car’s batteries. It will be interesting to see how he makes out and whether he got stranded somewhere with no battery power. I guess CAA or AAA will still tow your car to a recharging station. Who wants to have this happen especially when you are driving an expensive care like the Tesla Roadster. We have taken a different slant on this post about electric cars. The government and the manufacturers are really experimenting at this stage. They know that the electric infrastructure needs to be built up to facilitate more people purchasing these cars. They know it will take time. This is really the beginning of that infrastructure build up with California taking the lead. Let’s see how many states follow in the next 10 years. For more Tesla Topics and posts, click here.